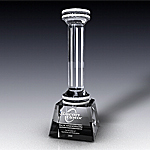 Crystal awards and trophies have many applications and serve multiple function from recognition to motivation. Because of high perceived value of crystal as trophy material, crystal awards have been gaining popularity and replacing other trophy materials such as marble, metal and glass. Most of the crystal awards produced commercially are manufactured from optic crystal, which is lead free crystal. 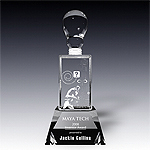 Our optic crystal awards and trophies are flawless, clear and have no bubbles or distortions. When hand polished and beveled by our most skilled craftsmen crystal awards produce an astounding sparkle effect. In addition our crystal engravers use sandblasting etch technique, which results in the sharpest image and text quality in crystal, and is far superior to other crystal engraving techniques. 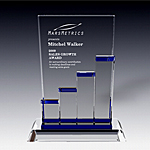 Recognition crystal awards are often presented to commemorate corporate or personal accomplishments. Life time achievement awards also fall into this category. 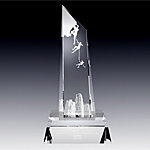 Crystal art USA offers a great selection of recognition crystal awards and trophies for every budget. The most popular styles are : star awards, mountain awards, Everest awards, eagle awards. Globe crystal awards are ideal for recognizing achievements with global impact. Motivational crystal awards serve a purpose of recognizing individuals who reach their goals and motivating them for an improved performance in the future. Motivational crystal awards are very important to boosting employee morale, employee retention and overall production. O ur popular motivational awards and trophies range from crystal awards plaques to crystal trophy obelisks and flame crystal awards. Service crystal awards serve a function of recognizing individuals for their years of service by commemorating their carrier milestones. Quite often companies implement service awards to recognize 5, 10, 15, 20, 30 years of employment. Also when employees retire, get promoted, or move companies or departments, service crystal awards are given as a parting “tank you” gift. 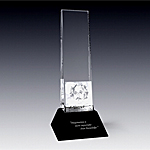 Popular service awards are crystal award plaques, crystal obelisks, crystal stars. Academic crystal awards are awarded to celebrate academic achievements such as graduations, research grants, degree accomplishments. These crystal awards also serve as recognition and motivation for teachers and educators. Golf crystal trophies are excellent tokens of recognition for those who find true passion in the game of golf. Crystal Art USA offers a great verity of golf trophies, from hole-in-one crystal awards to crystal tournament trophies as well as golf vases and bowls. Sport crystal trophies celebrate athletic excellence and athletic achievements. We offer crystal trophies for many sport categories including: baseball, football, tennis, soccer, basketball, volleyball. Many sport leagues have intrusted us with their sport award programs.